Whether it is a serious honing session or a few looseners before heading to the tee, we have four outside bays and six undercover bays for you to choose from. Range tokens are available from the golf shop or the bar priced at just £2.50 per 30 balls or £4 for 60 balls. The practice net is located just opposite the first tee and is perfect for just a few swings prior to your round. Please use the mat provided at all times. The green has four different pin positions and is great way to practice all kinds of shots from everyday golf course lies. You may use your own practice balls here as our range balls are made up of a softer compression. 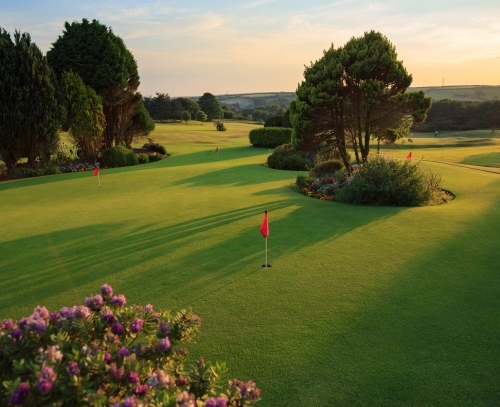 The putting green is situated right outside the main clubhouse and is also on the way to the first tee. It has been landscaped and also has its own water feature. It has been constructed to the highest USGA specification to match those on the course.